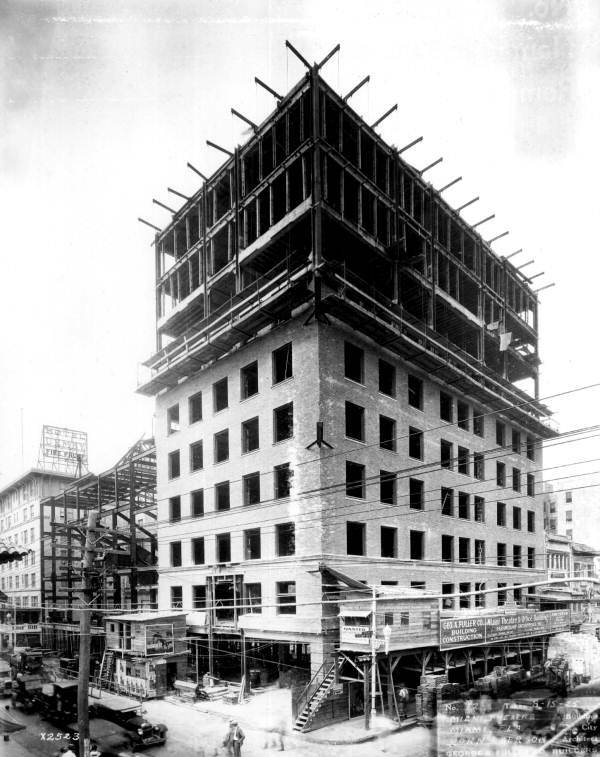 Construction of the Olympia theater 1925-1926. Photo courtesy of the Florida Archives. Downtown Miami’s transient cityscape is constantly changing. 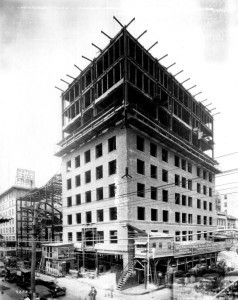 Several of downtown’s original structures have already been demolished to make way for modern office spaces and condominiums. Fortunately, the Olympia Theater is one of the few original Miami landmarks that still remains. Opened in 1926, the Olympia was a silent film palace commissioned by Paramount Pictures. 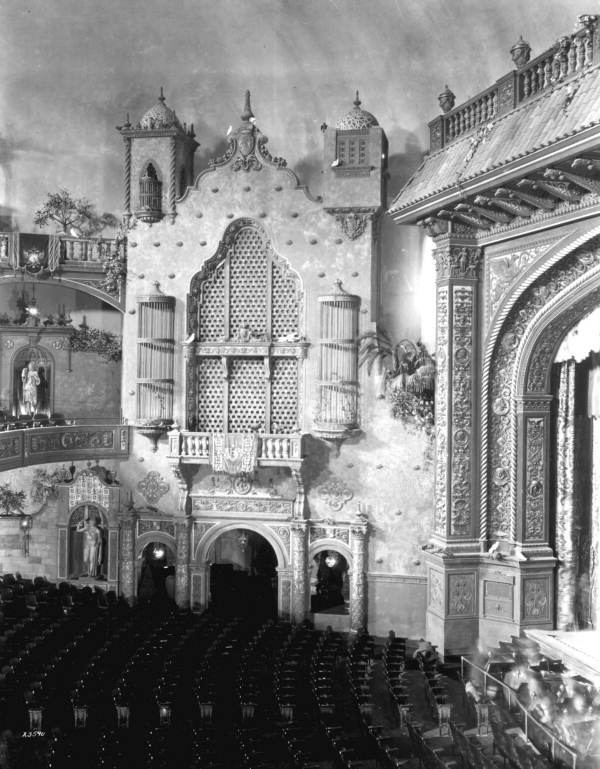 Architect John Eberson, best known as an atmospheric movie palace designer, was hired to design the theater. 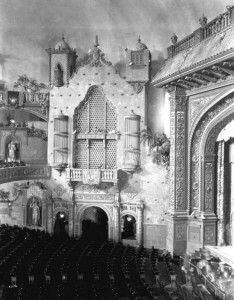 Popular in the late 1920s, this style of theater made moviegoers feel like they were outdoors in exotic locations, such as in Tuscan courtyards. One of the Olympia’s most unique features is its projected color-changing ceiling which mimicked the sunset and twinkling night sky. In order to further evoke an alfresco feel, Eberson adorned the theater with various outdoor features like arches, trellises, balconies and Greek statues. Other ornamentation included trees, palms, and vines, and even taxidermied birds. Today, the Olympia still features its original design elements, including the original Wurlitzer Organ which provided full orchestral accompaniment to silent movies. Olympia theater interior 1926. Photo courtesy of the Florida Archives. By the 1960s, the Olympia’s attendance had declined. The theater was set to be demolished and converted into a parking lot, until businessman and philanthropist Maurice Gusman stepped in to save the Olympia in 1975, investing over $4‐million of his own money to buy and refurbish the decaying 49‐year‐old movie palace. Gusman hired renowned MiMo architect Morris Lapidus to renovate the theater. The Olympia was renamed the Gusman Cultural Center in honor of the man who saved it. The renovated theater later became the headquarters of the Greater Miami Philharmonic Orchestra. 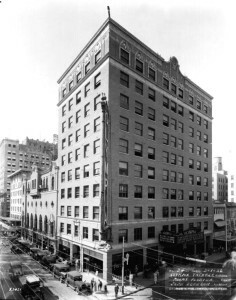 In 1975, Gusman donated the building to the City of Miami, under the condition it would be operated by the Parking Authority. The Gusman Cultural Center restoration continued from 1975 to 1977. In 1984, the National Register of Historic Places designated the Olympia Theater as a historic site. Presently, the building features affordable housing located above the theater, but city officials say the property could have many other potential uses, such as cultural offices for artistic groups or housing for artists at the theater. RUDG (Related Urban Development Group) LLC submitted an unsolicited proposal in May 2017 to form a public-private partnership with the City of Miami (owner of the Olympia) to redevelop the site’s 80 residential units and renovate the theater. Miami commissioners were scheduled to review the proposal, but the meeting was postponed due to Hurricane Irma. RUDG later withdrew their redevelopment plans for the property. The text of the original proposal vaguely suggested a plan to “demolish and replicate the existing building, above the theater” while also wanting to “renovate the theater.” According to neighborhoods.com, “the City of Miami now plans to issue a request for proposals based on the community’s aspirations for the uses and management of the theater, its adjacent office building, and the required repairs to the building.” Historic preservation will be the core of any redevelopment plans. This entry was posted on Thursday, December 21st, 2017 at 9:15 am and is filed under Uncategorized. You can follow any responses to this entry through the RSS 2.0 feed. Both comments and pings are currently closed.